Part one, 'The Horsey Story' tells the story of cranes at Horsey in John’s words, as told to Chris. Much of this draws on John’s memories and the many and detailed notebooks that John kept. Added to these are the diaries, reports and recollections of others, such as Peter Allard, Mike Everett and several crane wardens. 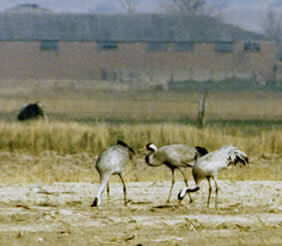 Right: it's 1979 and three cranes arrive at Horsey. The year by year accounts include elements of the story that are linked to that year. More general notes on behaviour and related subjects are in part two. Part two, Cranes: History, Observations and Management includes a history of cranes in the UK, how ‘Crane Country’ was shaped, and information on land management as it affects crane habitats for breeding and feeding. Observations on their behaviour at Horsey show the time and energy that John Buxton and his team of wardens have dedicated to cranes. The difficulty of access into fens and the birds’ secretive and sensitive nature make the observations made at Horsey especially valuable. We hope these will prove useful to land managers elsewhere in the UK as crane numbers increase. Nests at Horsey are often in a small pool in the reedbed. Though this book is primarily about Norfolk’s cranes, the common crane is the most widely distributed of the 15 crane species. 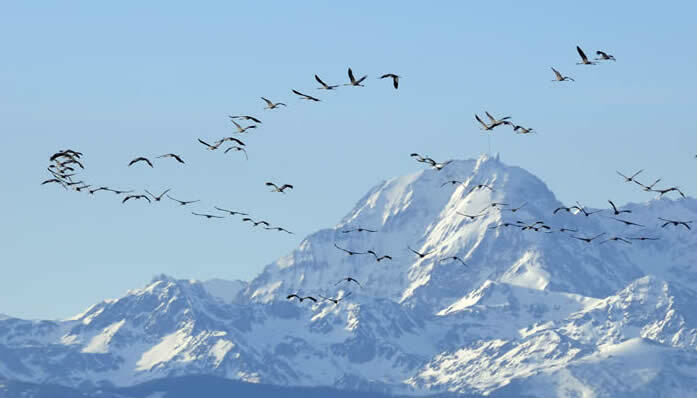 Cranes approach the French Pyrenees (Nick Upton) - in part three. Bookshops: Chris Durdin and Bridget Buxton hold the stock of books (not the publisher), and we welcome enquiries from bookshops who'd like to stock it. Please contact us. Hardback; 133 pages; 65 colour photos; six black & white photos; three colour illustrations, one of which is a map. Printed on paper certified by the Forest Stewardship Council www.fsc.org as having been produced sustainably. There is a book preview here - a whizzy page-tuner. The cranes were kept a secret in the early years. Steadily, as the years went by, the nesting cranes became an open secret and finally public knowledge. In recent years, the birds have started to spread away from their core area around Horsey into other parts of the Broads, the Fens and elsewhere. A reintroduction project into western England has established a breeding population of cranes there. So it was the ideal time to tell the Norfolk cranes’ story; in effect, how it all began. 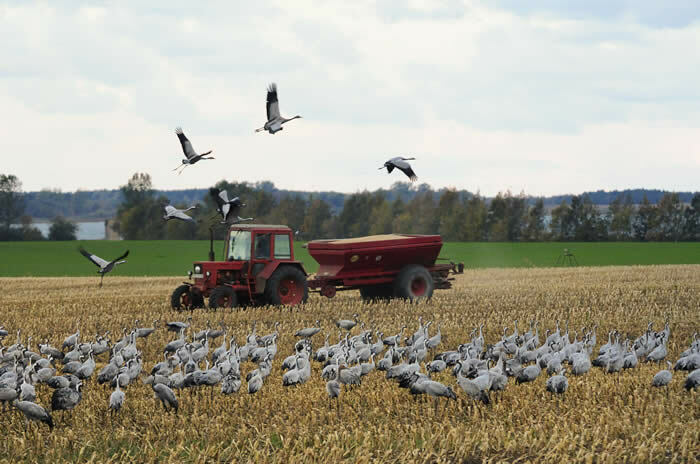 One aim of the The Norfolk Cranes' Story is to make available in one place the information about cranes gathered at Horsey over three decades. 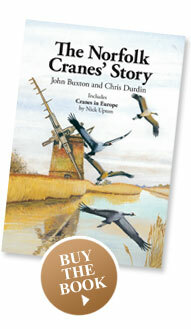 With that in mind, free copies of the book were given to Norfolk Wildlife Trust, the RSPB and the UK Crane Working Group. We can provide a copy (contact Chris), if it helps bona fide crane research or conservation. This website also holds useful reference material: see papers and advice in links. Half of the proceeds from book sales at three talks in November 2016 went to NWT's Hickling Land purchase appeal. Result: donation of £200 made on 1 December 2016.